Currently browsing articles with a topic of "striped bass". A lot has been written about the art in fly fishing. There is grace and beauty in a perfect fly cast. What is more satisfying than watching a colorful trout rise from a crystal clear pool to take a hand-tied floating fly? I just returned from Colorado where I had ample time to fly fish in the cold streams of the Gunnison National Forest. I don’t get to fly fish for trout much, but when I do, I’m always struck by the similarities to light tackle casting for rockfish on the Chesapeake Bay. One of the most important aspects of fly fishing is the ability to read the water and cast to where the fish are. Another is presenting the lure naturally so that it moves at the exact same speed as the current. While we don’t hear about it as much, there is comparable art in light tackle casting, even when it’s done with a spinning outfit or a baitcaster. 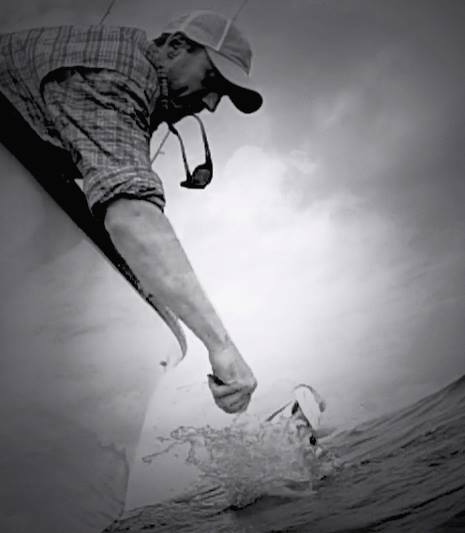 In my years of fishing both fresh and saltwater, I’ve had opportunities to observe the skills and artistry of some of the finest anglers in the world. As a teenager, I guided some of the best-known bass pros in the country when they practiced for tournaments in my home lakes in Tennessee. I’ve been fortunate enough to wade the pristine streams of the Smoky Mountains with the most knowledgeable anglers in the business, and I’ve fished for bonefish and pompano with the legendary guide families of the Bahamas. Most recently, I was joined on my boat Thunder Road by one of the best-known anglers in the world: the legendary Lefty Kreh. Lefty has been fishing for almost a half century longer than I’ve been alive. He’s forgotten more in his 92 years than I can ever hope to learn. We caught all the fish we wanted that day, and enjoyed several hours of inspiring conversation. Lefty’s fly casting skills are legendary, but his prowess with a spinning outfit is less well-known. Between hooksets, we talked about casting and jigging techniques as well as patterns and the best ways to approach fishing spots. At one point, the conversation turned to the art in fishing. I’m happy to say that after listening to Lefty’s jokes, advice, and aphorisms refined over his long life of fishing, I came away a better fisherman and, hopefully, a better person. Here are some of the thoughts I’ve collected about the art in light tackle casting: Read More! 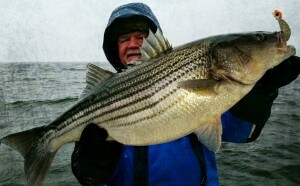 “It’s the worst winter ever.” Those words might sound surprising coming from Jamie Clough, a fisherman who has caught more forty-inch-plus rockfish in the last three months than most people will catch in a lifetime, but he’s right. It’s been tough. 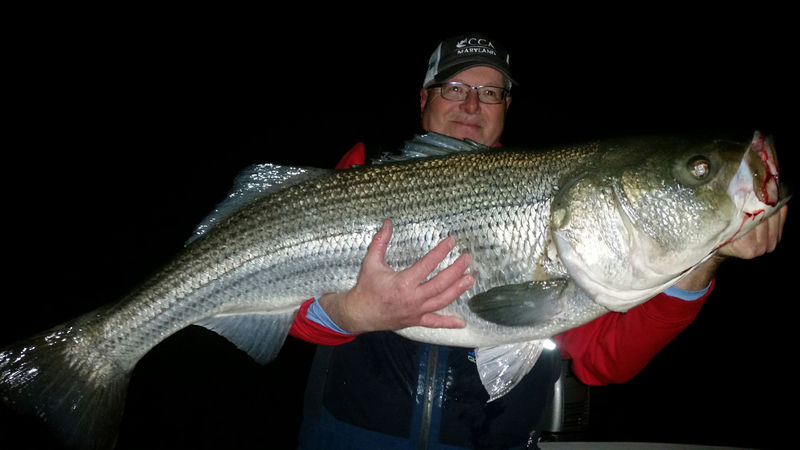 I’m on record for predicting that 2016 will be the best year in recent history for light-tackle striper casting on the Chesapeake Bay. I’m not taking it back, but after the first three months, I feel like I have some explaining to do. In past years, January, February, and March have been wide-open for fishing in the warm water discharges of the Patapsco and Potomac Rivers and around the power plants of the Mid-Bay. In February 2014, my fishing partners and I enjoyed the best day I’ve ever heard of, going forty over forty. Yes, that’s forty huge stripers over forty-inches long, all caught in one morning. The fishing was so good we were trying to glue two ten-inch Bass Kandy Delights together so we could pull out the biggest of the big fish. In years like that, you can make a lot of mistakes and still catch fish. While I’ve seen some good days since then, nothing like that happened this year. To catch big fish this winter, we had to pull out all the stops. Read More! Have you ever belly-crawled through the tall grass beside a mountain stream hoping to sneak up on your favorite fishing spot? Most freshwater anglers understand how important it is to be quiet and sneaky but I’ve noticed that some Chesapeake Bay fishermen don’t fully appreciate the concept of stealth. 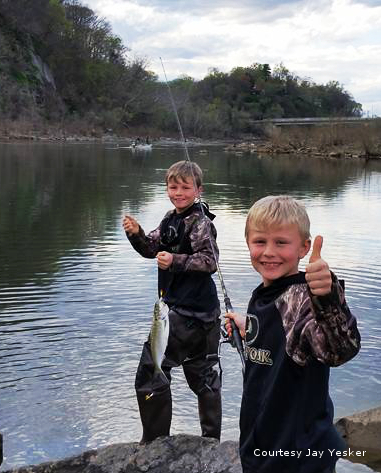 It won’t be long until the weather breaks and fishermen who are looking to overcome cabin-fever will pack into some of the better-known fishing spots like the warm water discharges, the Susquehanna Flats, and the mouths of Upper Bay rivers. 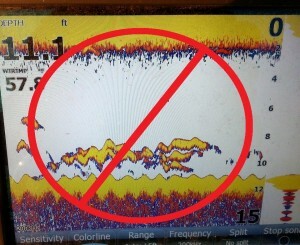 When fish are thick and hungry, you can stomp beer cans in the bottom of your boat and still catch them, but when they’re finicky, stealth becomes a lot more important. 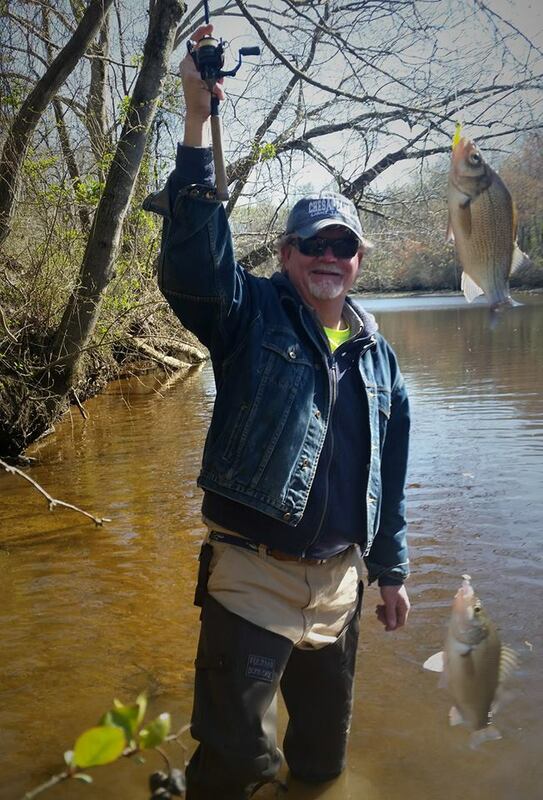 Spring on the Chesapeake Bay is the best time of year to catch the fish of a lifetime, but don’t forget that big fish get that way by being smart. While you might luck into a forty-inch-plus fish once in a while no matter what, your chances increase dramatically when you improve your noise discipline. 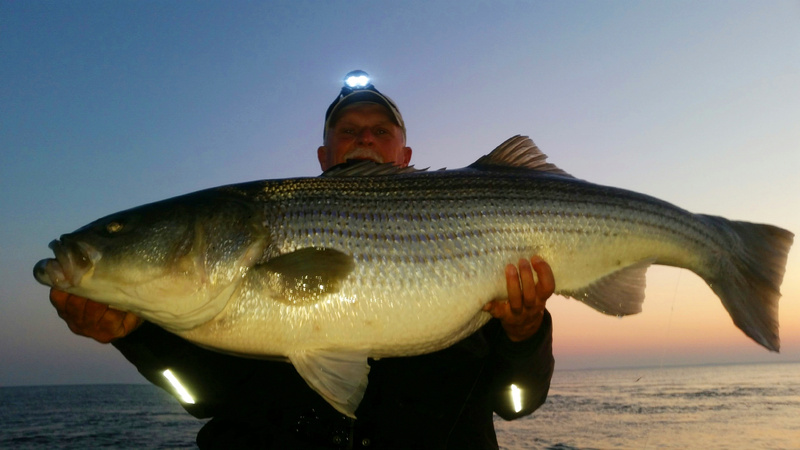 Here are some tips and tactics that are guaranteed to increase your odds of catching trophy stripers on light tackle: Read More! Jamie Clough, Rich Jenkins, and I joined Phil Kirchner for a run south out of Hoopersville recently. 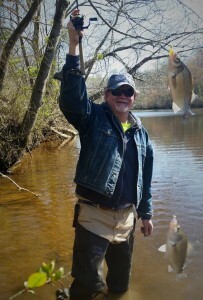 The weather hasn’t been great lately, but we’ve been catching some nice fish down around the mouth of the Potomac River. The forecast of light winds and snow flurries had us looking forward to a nice smooth ride and the opportunity to find lots of fish. Neither of those things happened! Instead, the Delmarva Pennisula and Southern Maryland were hit with one to three inches of snow and twenty-mile-an-hour winds gusting to thirty. Let’s just say the ride back was a little wet and sporty. Click the photo for the video and you’ll see what I mean. Below is my speaking schedule for the next few months. 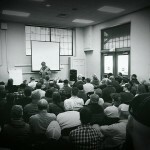 We were happy to see one of the biggest audiences ever for my talk last weekend at the Frederick Fishing Expo. There are several more coming up so I hope you can make it. 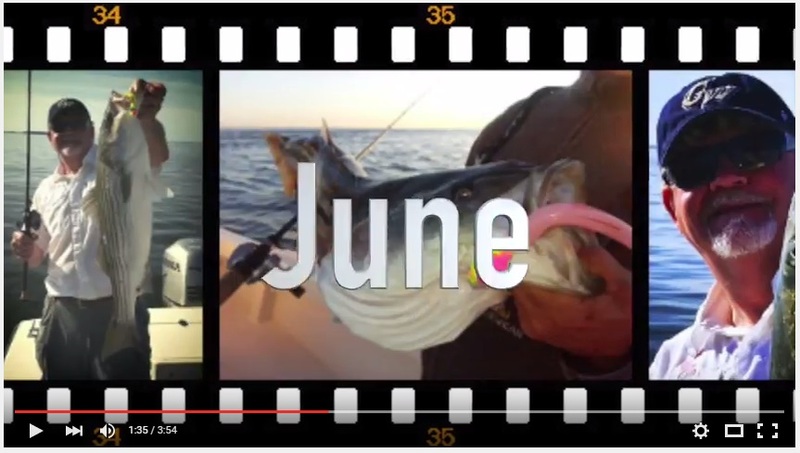 Most of my talks this winter will summarize my top-ten tips for trophy striper fishing. 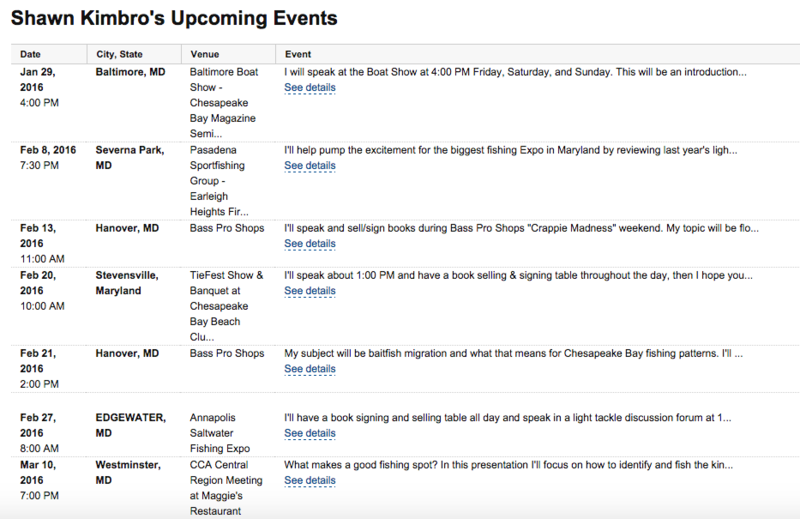 I’ll also break down float-and-fly crappie fishing at the Bass Pro Shops talk and the following weekend I’ll explain bait migrations in the Chesapeake and what that means for light tackle anglers. 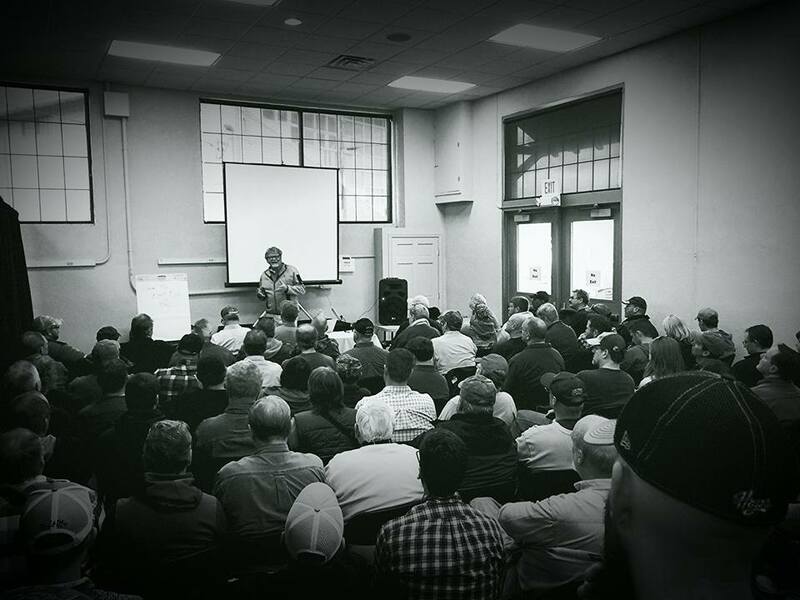 Also, I’m stoked to be on the same speaking schedule as Lefty Kreh and Bob Popovics at this years Fly & Light Tackle Fest. This year it’s at the Chesapeake Bay Beach Club just beneath the Bay Bridge on Kent Island. There’s more information about these fun events on my Amazon Author’s Page and I’ll keep you posted here and on Facebook and Twitter. I hope to see you at any or all or better yet, out there on the water! In January of last year I predicted on the HookedUp Fishing Forum that 2015 would be the best year for light tackle fishing in recent memory. Thanks to the robust 2011 year class, there was enough striped bass in the Chesapeake Bay to produce great fishing for light tackle anglers of any skill level. Better yet, most of us caught fish way bigger than those 17-21 inch 2011 fish. That’s because when there are more fish in the Bay, the older and bigger fish have to mix it up with the little guys to compete for food. 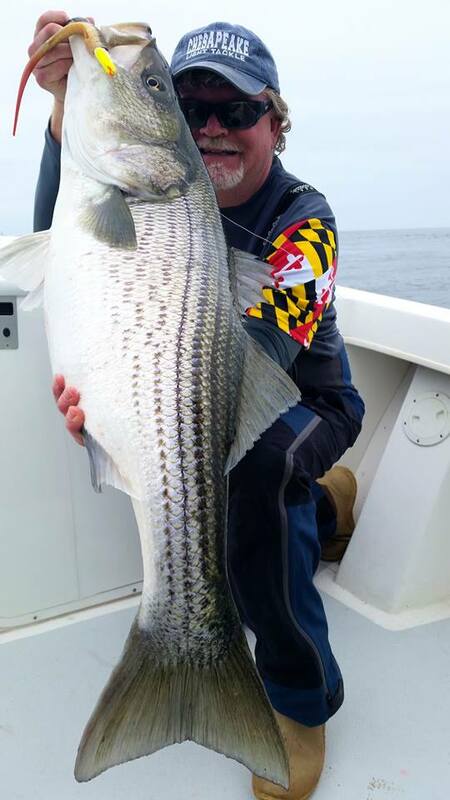 Thirty-inch stripers in July near the Chesapeake Bay Bridge were not unusual last year, and late-fall fishing in Southern Maryland was (and still is) the best it’s been in over a decade. That’s something to celebrate. Since 2015 was also a successful spawning year, we can hope for continued good striped bass fishing in the future. I’m especially looking forward to 2018. By that time, most of this year’s baby fish will be 18-inches or longer. At the same time, the 2011 fish will be approaching the 30-inch mark. Now that should be fun! If fisheries managers make the right choices, we should enjoy good striped bass fishing in the Chesapeake Bay for at least the next decade. About seven years ago, as I was enjoying a happy hour at the Boatyard Bar & Grill, someone asked me what motivated me to promote light tackle fishing. It seems like a losing proposition, they surmised, because the more people you turn on to your kind of fishing, the more crowded your fishing spots will become. That prophecy has been fulfilled, but I have no regrets. My answer is the same now as it was then. I believe that, as more people take up light tackle casting, more anglers will become conservationists and join the struggle to protect and preserve the fish we love to catch. That means more fish for everyone. Light tackle casting by its very nature puts the experience of fishing above killing fish for meat. Oh, most of us will keep fish from time to time, but we don’t have to in order to have a great time. We understand that every fish we release is a payment forward toward the future of fishing. If you enjoyed the fishing of 2015, this would be a great time for a New Year’s resolution. A very good one would be to give something back to the fish in order to repay a little of that enjoyment. 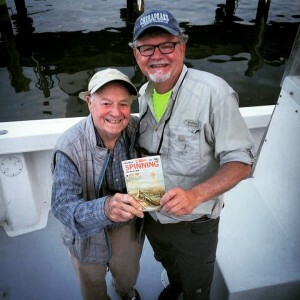 If you’ve read my books, you know I believe that the majority of light tackle anglers are conservationists at heart and that we are naturally positioned to lead because others want to share our fishing success. I was tremendously encouraged in 2015 when I saw lots more young light-tackle anglers joining fisheries conservation efforts. 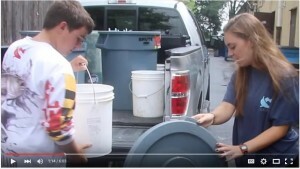 A great example is CCA Central Region’s Living Reef Action Campaign. If you haven’t seen it already, take a few minutes to watch this video about the work of Brett Hackett, Summer Miles, and the rest of the Central Region gang. There’s a lot of work to do. Habitat for fish, crabs, and other aquatic species in the Chesapeake Bay is under attack. Just as I am writing I am hearing that the Department of Natural Resources intends to begin destructive dredging on the historic Man-O-War Shoals oyster reef in the upper bay. At the same time, they’re suspending oyster restoration efforts near the Little Choptank river. There’s even a movement afoot to open the oyster sanctuaries to harvest. The intentional destruction of a living reef is illegal in almost every other part of the world. There are even places where you can be fined for dropping an anchor on a live reef. It’s a shame that the very department we trust to protect Maryland’s natural resources is so willing to put the financial interests of one group above those of everyone else in the state. So get involved if you can. Groups like CCA Maryland need your help. Giving back can be as simple as setting a personal example or by sending a letter or email to a local politician in hopes of swaying their votes on key issues. If you’ve received a little enjoyment from this beautiful Chesapeake region, then please give back a little of your time and resources. If you’ve received a lot, then I hope you’ll give back as much as you can to make sure the enjoyment you’ve received is passed along to your children and grandchildren. We simply cannot take the amazing resources in our beautiful region for granted. Yes, 2015 was a great year for light tackle fishing and hopefully there will be many more to come. Watching out for the continued well-being of the fish and the habitat they live in is the right stuff for keeping the Chesapeake healthy and our sport strong. Happy new year from Chesapeake Light Tackle!